Joyce motor mounts allow direct coupling to the motor shaft on either the right or the left side of the jack input shaft. For easy installation 2-ton through 20-ton jacks are available with motor mount adapters for standard NEMA C-faced motors. Jacks supplied with motor mounts are available with and without NEMA c-faced motors. When motors are included they come with the necessary hardware and coupling keys. Contact Joyce/Dayton about other types of motor mounts (i.e. pneumatic, servo, etc). All standard motors are 3-phase, 60 Hz., 208-230/460 VAC or 230/460 VAC. Other motor options are available. Maximum 1750 RPM input. It is important to consider the input torque a direct drive motor must deliver at start up. Brake motors (M2) are recommended for double lead jacks, ball screw jacks and actuators, and electric cylinders that are more than 30% efficient. If the motor frequency will be varied to provide a “soft” start, an inverter duty motor may be needed. Note: JAX® software may not accurately calculate horsepower required for systems having direct drive motors. Contact sales@joycedayton.com for assistance. 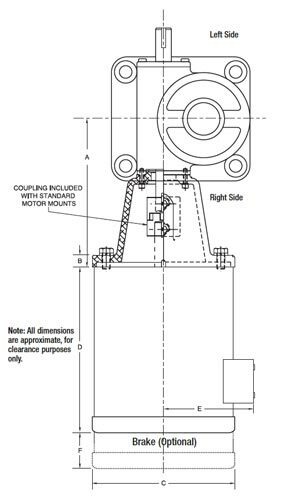 Since motor mounts are mounted directly onto jacks and actuators, they are specified as part of the complete part number. Refer to the ordering section for the products on which they will be used. Machine Screw Jacks, Machine screw ComDRIVEs, Ball Screw Jacks, Ball screw ComDRIVEs Electric Cylinders, Stainless Steel Screw Jacks, Metric Screw Jacks. Note: Drawings are artist's conception - not for certification; dimensions are subject to change without notice. Ordering information is found within specific product sections.